The Duck-Rabbit Craft Brewery is a small microbrewery from Farmville, North Carolina. Founded by Paul Philippon, a former philosophy professor at East-Michigan University, Duck-Rabbit opened and sold their first beer in August of 2004. As a former philosophy professor, Philippon chose the Duck-Rabbit/Rabbit-Duck illusion as his inspiration for not only the name but also the symbol of his brewery. Originally appearing in a German Humor Magazine in the 1892, the Duck-Rabbit was republished by Harper’s weekly in 1892; an American psychologist, Joseph Jastrow in 1899; a German philosopher named Ludwig Wittgenstein in 1953 and an American philosopher, Thomas Kuhn in 1962. The Duck-Rabbit represents the way in which the same image can be perceived in two very different ways. At the point, Jastrow, Wittegenstein and then Kuhn were making a very cogent point that perception is not directly dictated by outside stimuli, but rather by an individual’s perception of those stimuli. Whether you see the duck first, or the rabbit first often has more to do with other events in your life, for instance children are more likely to see it as a rabbit if they are shown an image of the duck-rabbit around Easter. The duck-rabbit shows that our perceptions may not always align with reality because we see either what we want to see, or what we fear to see. As for me, I prefer to see my beer glass full, or at the very least half full. On to the review. At Beeradvocate, Milk Stout has a score of 86. Over at ratebeer, it has a score of 94 overall and a 90 for style. Duck-Rabbit Milk Stout pours a dark translucent mahogany with a thin, light tan head that holds moderate retention, receding to the edges of the glass over the course of a few minutes and leaves behind intricate lacing. The aroma is milk chocolate, vanilla, caramel, roasted malts and a slight nuttiness with a low-level, lingering alcohol notes. The flavor is full of coffee, chocolate, caramel, smoke and roasted barley. It has a slight fruity sweetness and a tart lactic acid note (similar to yogurt), with a bitter-sweet finish. 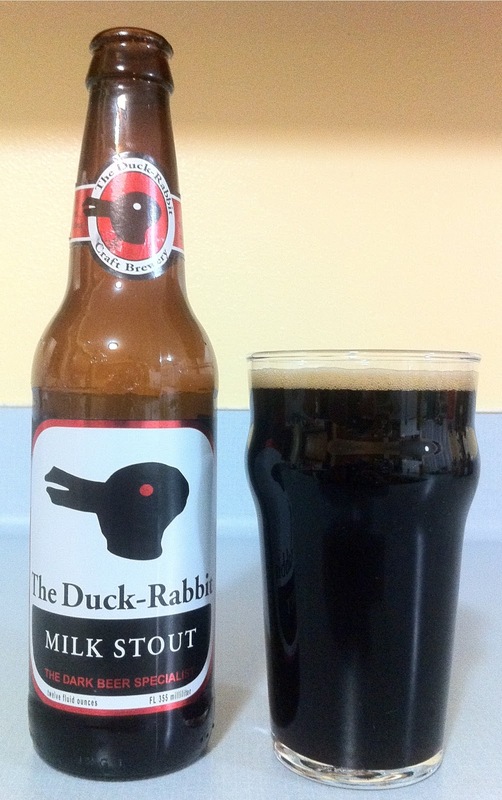 The Duck-Rabbit Milk Stout is medium bodied with a moderate to high level of carbonation. The Duck-Rabbit Milk Stout was a good milk-stout, and is certainly one of the better milk stouts that I have had. The only fault that I found with it was the slight note of lactic acid, which is a sign of infection. It did not distract from the beer, but I doubt it was an intended flavor. I would be very interested in trying another bottle to verify whether my experience was just a fault characteristic of one bottle, or if it is a true characteristic of the beer. That said, I am looking forward to the bottle of Duck-Rabbit Amber that I have waiting in my fridge. That’s all for today, be sure to check back on Wednesday for review of Duck-Rabbit Amber Ale.